Gingersnaps make me absolutely nostalgic. They take me right back to childhood and baking with my Mom We kids would kneel on a chair at the kitchen table so we could reach and we’d take turns dipping a glass in sugar and gently pressing down the gingersnaps before they baked. Gingersnap Cookies – perfect for the Holiday. I remember the glass wasn’t flat on the bottom; it had a design kind of like a snowflake. We were always so proud of our little imprints, but when the cookies came out of the oven, there was no sign of a design. Just sugary crusted crinkles. It was a mystery to my young self!! I can’t find that recipe for gingersnaps, but I did find this one that looks very close to what I remember. According to The Leaf, “Gingersnaps, also called ginger biscuits, are a type of cookie. The name comes from the fact these cookies traditionally are very crispy and make a snapping sound when eaten. Gingersnaps are a derivation of gingerbread and were invented hundreds of years ago. People in colonial times enjoyed these cookies, both in European countries and in America.” Closely related to Gingersnaps are other cookies, like these Molasses Spice Cookies. The Molasses Spice cookies are soft and chewy but the two cookies share a lot of the same spices and have similar flavors. I think these Gingersnaps are fantastic, and I certainly ate more than my fair share! Thank goodness my son, Kraig just happened to stop by and was able to help out with the “chore.” I also used the Gingersnaps to make my Make Ahead Pumpkin Cheesecake Parfaits. Yum! These homemade Gingersnaps were so good in that dessert. While the flavor was great, and after a bit of trial and error, these Gingersnaps baked up crisp all the way through, these cookies didn’t have the almost “shattering” crispness I think Gingersnaps should have. I didn’t flatten them with a glass, though, so I next time around, I’ll give that a go. I also thought about leaving these to cool in the oven with the door ajar, to see if that would help, but we have (okay I have) a little trouble delaying gratification. Make Ahead Pumpkin Parfaits. Layers of pumpkin mousse,whipped cream, crushed gingersnaps & chocolate covered almonds. 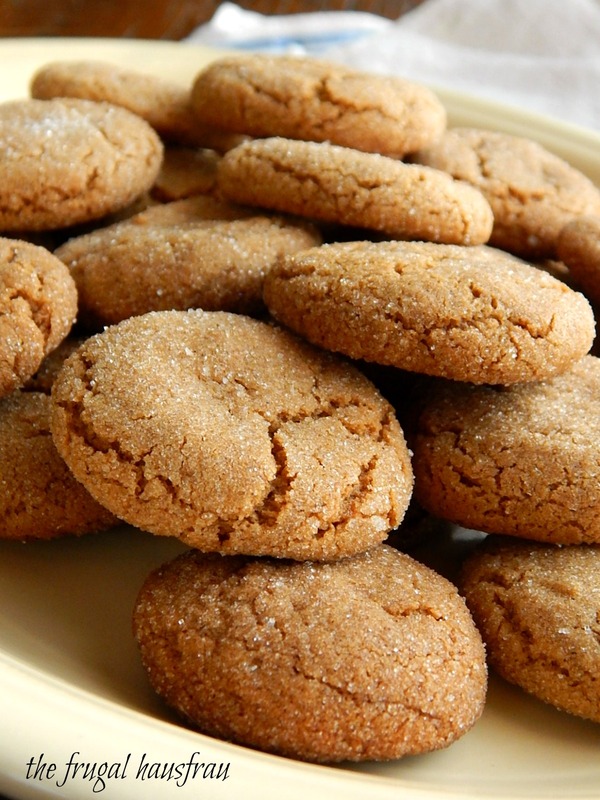 I’d recommend a little test batch when you bake your Gingersnap cookies. Put just a few on your baking sheet, bake them and then let them cool. It’s only after they cool that they start to crisp. Then you can see if the timing works in your oven to get you cookies that are crisp all the way through. My first cookie sheet baked up a little soft. Luckily I realized it while the second sheet was still in the oven so I added a minute to my timing. Here’s a case where you don’t want to use butter if you aren’t too opposed to using shortening. Shortening is the way to go, here. If you don’t want to use shortening, one of the premium European type butters might be a good substitute. I also thought the gingersnaps baked up best with the most crinkles when baked on a standard (not an air-bake) cookie sheet. I had the best results with my Gingersnaps when I baked them, 1 tray at a time in the top third of the oven. It takes a bit longer to get through all the cookies, but I think the quality of the cookie made it worth the extra baking time. If you have one, a scoop will help you get the most uniform cookies so the cookies will all bake up evenly and the same size. As far as the most bang for your buck, this is THE time of the year to stock up on baking goods and specials. Anywhere from pre-Thanksgiving all the way to Christmas, there will be specials and plenty of coupons, if you use them on baking items. See my list of Thanksgiving, Christmas and New Years Savings. There may be some minor sales around Thanksgiving, but the next big sale will be Easter. Whenever I bring anything into the house that contains flour, it goes right into my freezer for three days; that eliminates the possibility of any little peskies coming into the house along with the bag of flour or the flour related item. I rarely, if ever, see Molasses on sale. It’s not super pricey though and once you have a bottle of Molasses, it will keep literally for years in your cupboard. Just make sure that there is no sticky residue on the top of the bottle or the lid or the lid will stick so tightly you’ll never get it open again. Sift, or mix with a whisk, the flour, ginger, baking soda, cinnamon, and salt into a mixing bowl. Place the shortening into a mixing bowl and beat until creamy. Gradually beat in the white sugar. Beat in the egg, and dark molasses. Add flour mixture in three additions, mixing well after each. Scoop or pinch teaspoon portions of dough and roll into a ball about 1″ in diameter. Roll each ball into cinnamon sugar. Place 2 inches apart on an ungreased baking sheet. Bake in preheated oven until the tops are rounded and slightly cracked about 10 minutes. Cool cookies on a wire rack. Store in an airtight container. Note: Cookies bake best, one pan at a time, in the top third of the oven. I’ll be posting this Gingersnap recipe at Fiesta Friday 200. Be sure to stop by and vote for your favorite recipes on Tuesday! This entry was posted in Click here for Fabulous Food Posts and tagged Cookies, Desserts, molasses, shortening. Bookmark the permalink. My mother made ginger snaps like these when we lived in northern Alberta in the mid 1950’s. Shortening was hard to get, so she often used bacon drippings. Quite a taste sensation! Hi Catherine, your Mother was trendy before her time! I can imagine that they were amazing and would be so popular now!! Hi Debbie! They’re so good! I love the molasses cookies I have on here, too! Will have to check those out. Yum! Love a cookie with a history Mollie! these have pretty much the same spices as the gingerbread we make at Christmas– so I’m imagining just how they taste! They look spicy delicious!! hugs from here!! Hi Rhonda, and thanks! So perfect for Christmas! I have my cookie cutters out, so hopefully gingerbread men and women soon! Thanks! I have gotten kind of stuck on the idea of making this but I’m cutting myself off. I’m out of frozen whipped cream and I can’t imagine the calories, lol!! I appreciate it! 🙂 They’re one of my fave cookies especially around Christmas. Great recipe! Concur with your advice – just picked up 20 lbs of sugar for the rest of the year. Oh, the wonderful creations to come…. I’m not fussy … softer or crispy. They taste great and they get better as they sit in the cookie tin. I remember grinding some up and using them as a base for a pumpkin cheese. They’re great in parfaits too as you said. I haven’t made them in ages. Checked my recipe and Crisco (veg shortening) is what I used too. That sounds so much better than pumpkin cheese, lol! I DID see pumpkin spice cheese at the grocery store. I was offered a sample, but I just laughed at them and shook my head, lol!! I’m not a big fan of pumpkin. I remember my mother making strudel with grated pumpkin in it, when I was a kid, but it didn’t get a great response from my brother and myself. My dad (who had a real sweet tooth), of course, gobbled in down. Later on in my late 20s, my brother and SIL started a chocolate store (he took beginning classes in becoming a chocolatier) and he made several seasonal fudges … including cranberry and pumpkin. I LOVED the pumpkin version, surprisingly. Oh, I bet it was fun to taste test everything! 🙂 There are a couple of stores around here that just sell candies and lots of fudge, but I’m usually prone to just get the classic. I might have to be more open minded! I’ve made half a dozen different flavours of fudge to date including cranberry but I have yet to try making pumpkin fudge at home. They’re almost identical. I wonder if the sifting made a difference. Also mine look lighter – I wonderm now, if I forgot to add the cloves and didn’t realize it? Do you remember if you went full white sugar or 1/2 white and 1/2 brown. I would think the brown sugar would make a softer cookie, but I used all white. I also noticed that I didn’t ‘press down’ on the balls of dough before baking. I would have made note of it in the recipe. These look so beautiful and I think I have all of the ingredients to try em out! I simply love gingersnaps, but never made ’em. I like my super-crunchy-crispy… I’m not a baker by any stretch of the imagination, but I wonder if they will come out crisper with a little less baking soda added?